Neopol is an all-purpose polish that cleans, restores, nourishes and protects. It’s suitable for a wide range of surfaces including wooden or laminated, whiteware, plastic, leather, vinyl and fiberglass. Easy to apply with a soft cloth, Neopol produces a rich durable finish. 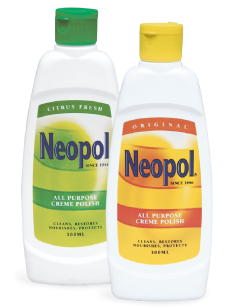 Neopol Original and Neopol Citrus Fresh are the trusted, quality creme polishes which are easy to apply and provides rich durable finish. The unique blend of ingredients spread easily to clean, polish and provides lustrous protection. Always follow directions for use. 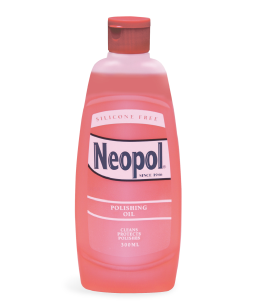 New Neopol Polishing Oil gives a brilliant long-lasting lustre to natural wood, furniture, pianos and antiques. Always follow directions for use. 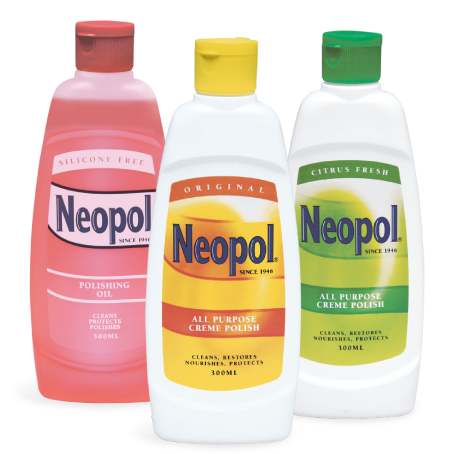 - Apply Neopol thinly to a soft dry cloth and rub gently over the surface. - DO NOT apply directly to furniture.  - Use regularly to ensure furniture is conditioned adequately. - Contains no wax or abrasives. Available at your favourite supermarket now! Would you like to hear more from us? We will let you know when we are running competitions, promos etc.